THE MOST REVEREND JOHN M. FARLEY D.D. Archbishop of new York, 1903 - 1918; created Cardinal, 1911. On the 30th of June 1979 Archbishop Tomas O'Fiaich was elevated to membership of the Sacred College of Cardinals of the Holy Roman Church. Many people would have claimed the appointment as a unique achievement for a son of the Parish of Lower Creggan. The new cardinal himself knew that this was not so. To understand the story we must go back to 1978 to the residence of the Archbishop of New York on Madison Avenue in that city. Archbishop O'Fiaich was there as the guest of his friend Terence Cardinal Cooke. As they both surveyed the portraits of former occupants of New York, Archbishop O'Fiaich's attention was drawn to one particularly distinguished looking prelate. He asked about the man's origins and his host's reply was both amusing and surprising. "This man came from Ireland - you probably have never heard tell of his home place - he was born in a place called Newtownhamilton." The picture was that of John Murphy Farley, the 4th Archbishop of New York from 1902 - 1918. On a reciprocal visit to Armagh in 1979 Cardinal Cooke expressed a wish to visit the birth place of John Farley, to pray at his parents' grave and to celebrate the Eucharist there. Thus, it was on the evening of the 14th of August 1979 that an overflow congregation received the two cardinals in St. Michael's Church. The tone of the evening was one of great joy. The outside of the chapel was decorated with flags of church and state. Inside, within the Sanctuary, massive floral arrangements added to the solemnity of the proceedings. Two images are salient from that night, the great physical stature of Cardinal Cooke which was further enhanced by an ornate chasuble and tall mitre and the newness and radiance of the red mozetta worn by Cardinal O'Fiaich. In his homily, Cardinal Tomas spoke of the distinction of the parish in now having two of its own counted among the members of the College of Cardinals. He spoke of Cardinal Farley's distinguished service in the church in America and of Cardinal Cook's admiration for his predecessor. There was much history in the telling and even a little in the making. The congregation was enthralled by every word and the sermon was punctuated by spontaneous and sustained applause. That two cardinals should come to honour the memory of a third in his own village was approbation indeed. This was surely one of the happiest occasions in the history of that little church. To honour his visit, Cardinal Cooke was presented with a crystal rose bowl from the congregation. The presentation was made by Malachy Conlon who was soon to begin studies for priesthood. There is no doubt that Cardinal Cooke was moved by the sincerity of the welcome he received, for soon afterwards he sent a gift of 2000 dollars which was to have been used to fund a memento of his visit to the church. In February of 1980 the curate Fr. Seamus McGinley was pleased to receive the portrait in oils of Archbishop John Farley sent to him from New York by Cardinal Cook. The painting is in the keeping of the congregation of St. Michael's Church and the present incumbent Fr. Aloysius McCourt has placed it on a wall in the Sacristy. Now, very appropriately, in the year that marks the 150th anniversary of his birth the image of John Murphy Farley hangs just two yards away from the remains of his beloved parents. It must he recorded that the name of John Farley had never been forgotten by the people of Newtownhamilton. The mention of his name would immediately draw a response which associated him with the stained glass window above the altar in St. Patrick's Church, Cullyhanna. This is a controversial point and I shall return to it later. What of this local boy who scaled the ecclesiastical heights in the new World? John Murphy Farley was born on April the 20th 1842 to Philip and Catherine Farley (nee Murphy). He was the youngest of four children. Tradition has it that his father originated from Roserea and that his mother came from Moyles in Co. Monaghan. It is known that they were the proprietors of a grocery and hardware business and a small agricultural holding the combined incomes of which made them relatively wealthy. Local tradition locates their properly as that presently owned by Mr Sean O'Rourke in Dundalk Street. Through lack of records we can only presume that young Farley was christened in the new chapel on Peppers Hill which had been built some eight years earlier in 1834. We know that he did attend the local National School situated in Dundalk Street on the site, now occupied by the house of Mr Michael Murray. When the school was moved to its present location on Dundalk Road in 1893 the old school house was converted to use as a blacksmith's forge which was run by the Callaghan brothers. One of John Farley's teachers was Master Thomas Macken of Dundalk Street (1833-1912) father of the late Mr Bernard Macken of living memory. Master Macken became a life-long friend and correspondent of the future cardinal. In 1851 tragedy struck the Farley household with the death of their mother Catherine. Three years later they were orphaned by the death of their father Philip. John was then just twelve years old. There is some evidence to suggest that the children may have left Newtownhamilton temporarily to stay in Co. Monaghan with their late mother's family or that some member of the Murphy family came to live with them for a time in Dundalk Street. In 1864 at the age of 22 John Farley left St. Macartan's and Ireland to sail for his new home in New York and further studies in Fordham Junior Seminary. It is recorded there that he led his class so clearly that he won eight out of nine subject prizes, missing only the one for Religious Studies. His excellence did not go unnoticed and after a year at St. Joseph's Seminary in Troy, New York, he was sent to Rome in 1866 to finish his studies at the North American College. On the voyage to Europe he was seized with a grievous illness which threatened his life. He soon recovered and able to devote himself to his vocation, although his health in Rome was never robust. Reverend Farley was ordained on the 11th June 1870. His sojourn in the Eternal City coincided with the first Vatican Council and he witnessed the definition of Papal Infallibility on the 20th of July 1870. Upon his return to New York the new priest's first appointment was to a curacy in St. Peter's Parish, Staten Island. Two years later he was chosen as secretary to Archbishop McCloskey whom he had met during the Vatican Council in Rome. On assuming his new position he changed the spelling of his name from Faffelly to Farley to match the prevailing pronunciation. This was the beginning of an association with the Archdiocese which was to last for forty six years and would take John Farley slowly up the ladder of ecclesiastical preferment. Indeed, he received every honour available except the Chair of Peter itself. In 1884 he was awarded the title of Monsignor and was given his own parish, St. Gabriel's, where he acquired wide pastoral experience and deepened the sympathy for the poor that led later to his being called the 'Cardinal of the poor'. He was consecrated titular bishop of Zeugma on the 21st of December 1895 by Archbishop Corrigan. He was then fifty three years old. He was the first auxilliary bishop, as distinguished from a coadjutor with the right of succession, to be appointed to New York. In October of 1901 Bishop Farley started for a visit to Rome and a pilgrimage to the Holy Land. He was on his return journey and en route for Lourdes when Archbishop Corrigan died, after a short illness, in May 1902. He came home at once and was made Administrator. On the 15th of September of the same year Pope Pins X appointed him Archbishop of New York. The new Archbishop was described as being gracious in manner and dignified in bearing though small in stature. He was a pleasing speaker with the faculty of saying things that would influence strongly the lives and actions of his audience. He spoke French and Italian fluently and was well versed in the literature of both languages. He had the gift of getting on with people of all types although he disliked flattery and ostentation in any form. He was a very happy man whose cheery disposition brightened all those who came in contact with him. He was an enthusiastic traveler who prepared diligently for intensive sight seeing on each trip. As a lover of peace he sought to maintain peace in his diocese. He had been one of the most enthusiastic supporters of a peaceful solution to the Irish National Cause. At different times, delegates sent to plead the cause of Ireland to America, such as Mchael Davitt, John Redmond, John Dillon, Joseph Devlin and William Redmond, had been warmly and generously received by His Grace. He was one of the first to welcome and extend practical support to Dr. Douglas Hyde, who as president of the Gaelic League traveled throughout America on behalf of the Irish Language Movement. He never forgot his home and would often remind his clergy that the prosperity of the diocese depended on the hard work and faith of its people of whom many were Irish. Archbishop Farley was always anxious to help anyone from his native town should they he in search of employment in New York. On the 28th of October 1911 he was notified of his elevation to the Cardinalate with the titular church of Sancta Maria Sopra Minerra. He went to Rome where the insignia of his high office were conferred on him by the Pontiff Pins X. On his return he received a public welcome which spoke volumes for the estimation in which he and the Church were held. Writing in The Ecclesiastical Review of February 1919 Monsignor M.J. Lavelle recalls of the home-coming. "It was probably the most wonderful demonstration ever made by the great City in honour of any individual." He arrived home on the steamship 'Berlin' on the 18th of January 1912. He was received at the pier by the leading clergy and laity. As the procession passed up Broadway and Fifth Avenue, the streets were lined for a distance of four miles with thronging multitudes whose ringing cheers gave testimony to their affection and joy. All the buildings, public and private and all the churches were decorated in honour of the occasion. The Cathedral and its adjoining streets were packed with people who joined heartily in the glad 'Te Deum". Every night the exterior of the Cathedral was illuminated with electric lights which made the great structure shine like a palace of fire. Perhaps the most remarkable feature of the entire celebration was a public dinner given for him in the Waldorf-Astoria Hotel by prominent non-catholics on the 31st of January. The toastmaster was Herman A. Metz comptroller of the city. Speeches were made by Governor Dix and Mayor Gaynor. President Taft sent a letter in which he said; "I regret I am unable to be present at the dinner for Cardinal Farley on his elevation to the highest rank of the Roman Catholic Church. The non-sectarian character of the dinner is an indication of the great progress we have made in mutual tolerance and brotherly co-operation. Please present my compliments to Cardinal Farley with whose friendship I have been honoured for many years". During his years as Bishop and Cardinal, Dr. Farley espoused many causes. Principal among these was Catholic education. He was instrumental in providing increased opportunities in secondary and tertiary education for every class and background, and did much to increase vocations to the religious life. He organised the production of the Catholic Encyclopedia, the first complete Catholic work ever published in the English language. Archbishop Farley showed a great flair for organising major celebrations and had three in four years. One such marked the centenary of the establishment of the diocese in 1908. Cardinal Michael Logue gave the address in St. Patrick's Cathedral to mark that milestone. The second notable event took place when he presided over the solemn consecration of St. Patrick's Cathedral in October. 1910. Again the homily was delivered by his friend the Irish Primate Michael Logue. The consecration was for the Archbishop, the happy culmination of a long association with that great building. The third important event was the celebrations following his elevation as Cardinal detailed above. The Census of Catholic Population details the diocese of New York which, incidentally, includes the Bahamas, as having 1,219,920 Catholics representing roughly one third of the entire population of the city. It contained 1002 clergy who cared for its 347 churches. The various seminaries recorded 514 clerical students. It was, at that time, the largest, strongest and most important Catholic unit in the United States and the most populous in the world. During his later life he made at least three visits back to Newtownhamilton. 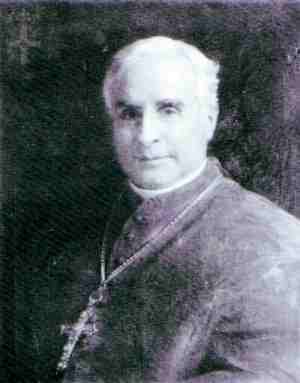 The first was in 1891 while he was vicar General of the Archdiocese. In 1906 he returned as the guest of Cardinal Logue and was received with all the pomp and ceremony which might attend a visiting Archbishop. The Newry Reporter of Thursday the 23rd of August 1906 caused the following report. THE ARCHBISHOP OF NEW YORK - VISIT TO NEWTOWNHAMILTON "On Tuesday last the 21st inst., The Most Reverend Dr. Farley, Archbishop of New York paid a visit to Newtownhamilton, the place of his birth and boyhood. He drove in a carriage from Castleblaney accompanied by his two chaplins and by the Rev. Peter Kerley P.P. Cullyhanna. His Grace was met at the Catholic Church by the Rev. A.P. Smyth C.C. Newtownhamilton, the Rev. P.A. Macken C.C. Ballymacnab and by his old teacher and life-long friend Mr Thomas Macken, Newtownhamilton. The Archbishop visited the graves of his father and mother and passed some time in silent prayer over their remains. Though he left his native place when only about 14 years of age, he still retains a distinct recollection of the various persons and scenes around Newtownhamilton and spent quite a while in recalling events of bygone days. Through all the years that have gone he never forgot the place of his birth and many times evinced his love for it in assisting any person from his native town who might seek his influence and assistance in obtaining lucrative employment in the New World. He afterwards drove on to see the beautiful new church at Cullyhanna and was the guest of the Rev. Peter Kerley P.P. During his third visit to Ireland in the summer of 1909, Archbishop Farley. now aged 67, was received by Cardinal Logue and the Diocesan Chapter in the Synod Hall of the Cathedral in Armagh. He was given a warm address by his Eminence. Some days earlier the Cardinal had hosted a reception in the new hotel in Carlingford, attended by many local civic dignatores, in honour of Dr. Farley, the principal guest. The closing years of Cardinal Farley's life were overshadowed by the Great War of 1914 - 1918. The Cardinal immersed himself completely in the war effort and raised five million dollars to fund hospitals and convalescent homes. The war hastened the death of Pope Pins X, whose successor Benedict XV (1914 - 1927) was elected on September 3rd, the morning of the first day of the Battle of the Marne, the first great battle of the war. Cardinal Farley was in Switzerland when the war broke out and consequently was able to travel to Rome for the conclave. It could be said, therefore, that he was the only man from South Armagh ever to have participated in a papal election. Here at home Archbishop Farley dedicated two stained-glass windows to the memory of his parents. The first, (2) in St. Patrick's Cathedral, Armagh, depicts the martyrdom of St. Catherine of Alexandria and St. Philip Neri attending the sick. The window was executed by the famous German firm of Meyer from Munich. The second window(3) above the high altar in St. Patrick's Church, Cullyhanna, is a work in four sections which portrays the crucifixion and entombment of Christ. It may also be the work of Meyer but this fact is as yet not verified. There is a little controversy about its original location. It has long been the opinion of many in Newtownhamilton that the window was initially intended by the Archbishop for St. Michael's. This is home out by reports of the glass actually having been delivered to the chapel where it sat for some time. It was then allegedly removed at the behest of Fr. Peter Kerley and placed in the new church at Cullyhanna. Fr. Kerley was parish priest for 34 years, the largest in the history of the parish (1891 - 1925). On the scale of intra-parish rivalries such an action could neither be forgiven or forgotten whatever the intended location for the window it is recorded that Archbishop Farley went to view it during his visit in 1909. In May of 1917 the Cardinal underwent major surgery and withdrew from public view. His last official engagement was in July of 1918 where his deterioration was very evident. On August he developed pneumonia and died on the 17th of September. The Cardinal passed away in a hospital in Orienta Long Island and two days later his body was brought to New York. Monsignor Lavelle recounts the depth of mourning witnessed there. "The cortege consisted of fifty automobiles filled with representative clergy and laity. The entire route from Orienta to the Cathedral, twenty five miles long was lined on both sides by sorrowing affectionate people, whose tear-stained faces showed their sense of loss. The body lay in state in the Cathedral from Friday until the following Tuesday. The multitude that came to review the remains was so large that the police, to preserve order were obliged to make two lines five persons deep, running northward on Fifth and Madison Avenues. These lines reached on both Avenues to Seventieth Street a mile above the Cathedral. Vespers for the Dead were sung every night. On Saturday there was Pontifical High Mass for the convenience of the children, and on Monday for that of the Religious. At all these services the great church was thronged. On Tuesday the 24th of September. the final obsequies look place in the presence of three cardinals, the Apostolic Delegates, forty two Archbishops and Bishops, twelve-hundred of the clergy of all ranks and an immense concourse of people who, not only filled the sacred edifice, but extended for great distances in every direction beyond. His remains were laid to rest beneath the High Altar. Few, conceive that taking him all in all, anyone can be a greater Archbishop of New York than Cardinal Farley." The description of the obsequies does find a very striking parallel with the funeral rites of our own lamented Cardinal Tomas and indeed, on reflection one could enumerate other similarities of character erudition and philosophy shared by both these great sons of Creggan Lower. Newtownhamilton can be justly proud of its most illustrious son His Eminence John Farley.